The prices listed on our website are accurate and up to date to the best of our knowledge. Please understand though that all manufacturers raise their prices periodically and seldom notify their dealers that they will be doing so. We adjust the prices accordingly as soon as possible but this is extremely difficult considering the large amount of products advertised on our website. West End Motorsports Inc. reserves the right to change prices anytime and is under no legal obligation to honor a price that is incorrect or out of date. Your satisfaction is very important to us however so West End Motorsports will honor the incorrect, lesser price whenever possible. 1. You will not be charged for the item right away- Instead we will notify you immediately that the price on the website is incorrect and inform you of the correct selling price. 2. You are under no obligation to buy the product at the greater price and we will cancel your order without penalty if you decide not to. If you accept the updated price, your order will be processed as usual. 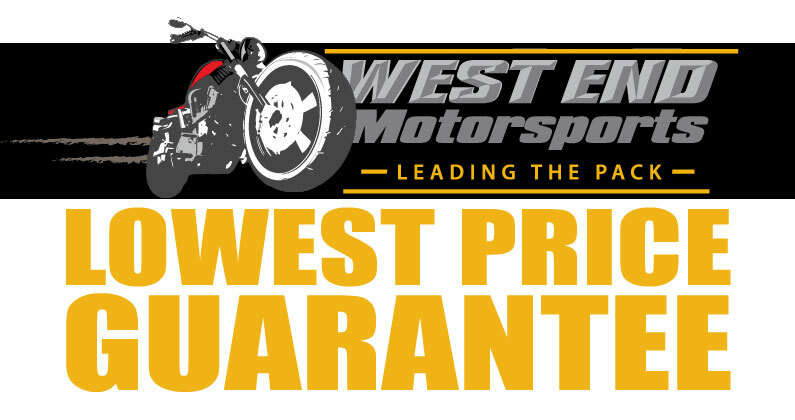 West End Motorsports Inc. guarantees to beat any competitor's price on any item we carry, whether it is currently listed on our website or not. Simply call us with the URL of the competitor's website so we can confirm the lesser price. Please do your research BEFORE placing the order because we cannot do retroactive price matching or give refunds after the order has been placed. 1. We can only price match on identical items (same product, manufacturer, color etc.). Retailers don't always use the same part number but we will do our best to confirm that it is the same product. 2. The price must be an advertised, internet price that a West End Motorsports staff member can clearly verify. We can not price match dealer or phone quoted prices so please do not ask us to call elsewhere. 3. We price match based on the total cost of the order- not just the product price. If a competitor charges shipping or tax when we don't, we will tack that on to the cost of the product when verifying the price match. We may still do the price match for you but the shipping and tax will be taken into consideration and added to the price of the item. 4. West End Motorsports reserves the right to not sell any product below cost or so close to cost that we would lose money on the transaction. If a competitor is having a closeout sale or selling an item at a price too low to economically match or beat, we may elect not to sell the product. 5. Each product is assigned a specific suggested retail price directly from its manufacturer. If the competitor has the incorrect retail price it means that they have outdated or incorrect information about the product and may be selling it cheaper then they intended to. We are not obligated to match the price of a competitor with the wrong retail price and please be advised that they may not be able to sell you the product at the advertised price either when they realize the error. 6. We will only price match with reputable online retailers- We do not price match E-Bay auctions or other websites of that kind. Please remember that the lowest price is not always the best deal. When you buy a product from us you are also buying security, exceptional customer service, and much much more- You can't put a price on those benefits!